While research often focuses on the retirement bound individual or couple, few people live their lives with no outside influences. A parent’s desire to lighten a child’s burden could have a negative impact on the parent’s retirement security, and such altruism from older generations might indicate a willingness to accommodate Social Security reforms that might benefit the young more than those closer to retirement. 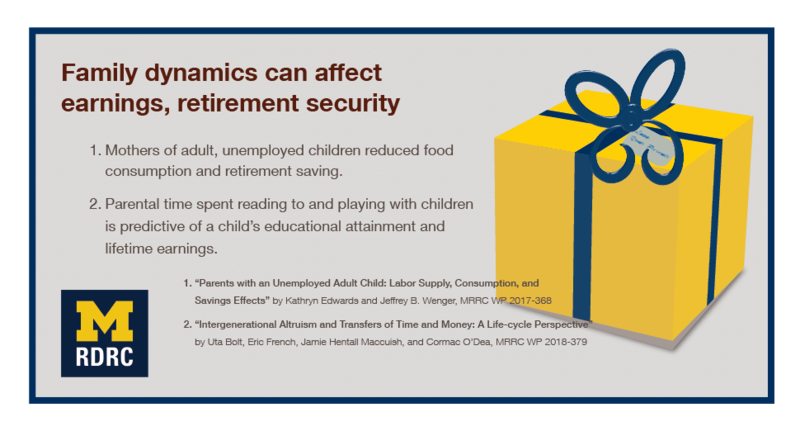 Two recent MRRC projects looked at how family dynamics might affect retirement security. For “Parents with an Unemployed Adult Child: Labor Supply, Consumption, and Savings Effects,” RAND researchers Kathryn Edwards and Jeffrey B. Wenger used Panel Study of Income Dynamics (PSID) data to investigate how older mothers adjusted their spending and savings when a child faced unemployment. In the PSID, 60 percent of the unemployment observed occurs before age 30. The median age a mother can expect to be when her adult child becomes unemployed is 55. Therefore, an adult child’s unemployment frequently comes right when Mom needs to focus on retirement. The researchers divided the mothers into those younger than 62 years old (preretirement), those 62 to 70 (retirement window), and 70 years and older (retired). Children were required to have been working (not just having graduated from school, for example), and they had to maintain their own household. The researchers did not look at co-residence. Edwards and Wenger confirmed that there were financial transfers to children. At any given time, the mothers sent about $270 a year to their child. This went up to $334 the year of the child’s unemployment. Preretirement mothers increased their employment by three and a half days to a mean of about 32 weeks per year. There was a very slight uptake in Social Security claiming for partnered women who hadn’t yet claimed by age 65. Food consumption dropped from an average of $11,000 a year by about $224 — with a larger drop for retired moms. Preretirement working mothers decreased their retirement savings from 0.7 percent of income to about 0.45 percent for that year. Retirement-window mothers increased savings by an average of 3.4 percent. Edwards and Wenger’s study provides evidence that parents – mother’s at least – want to provide their adult children with a safety net. In their project, “Transfers, Bequests, and Human Capital Investment in Children over the Lifecycle,” Eric French (University College London), Andrew Hood (Institute for Fiscal Studies), and Cormac O’Dea (now at Yale University) try to understand how older generations’ altruism toward their children might impact Social Security reforms. To better pin down altruism’s prevalence and effects, French and his co-authors built a long-term, over-lapping generations model that looks at transfers of time and money at multiple stages of the life cycle. The researchers used data from Britain’s National Child Development Study (NCDS), which, every seven years, collects children’s test scores and asks detailed questions on time investments during childhood (reading to/playing with child), educational investments (choosing residence based on school quality, interest in child’s classes), and as children age, their employment outcomes and parental cash investments of transfers and bequests. The authors then examined the effects of such investments on intergenerational correlations in education, income, and wealth. Parental education is correlated with child’s educational attainment: 66 percent of children with a college-educated father attend college; 20 percent of children with low-education fathers attend college. Children with college-educated fathers inherit around $40,000 more than those with low-educated fathers. Average lifetime earnings for sons who have fathers with only compulsory education is approximately $951,000 compared to $1,156,000 for those with fathers with some post-compulsory school, and $1,327,000 for those with fathers with some college. Parental time investments such as reading to and playing with children turn out to be predictive of a child’s ability and future success as well, with a one standard deviation increase in parental time spent with children at age 7 increasing normalized ability by 0.13 standard deviations at age 11. Whether the parental altruism evidenced in these studies would translate to supporting Social Security reforms might need to be left to a future natural experiment.